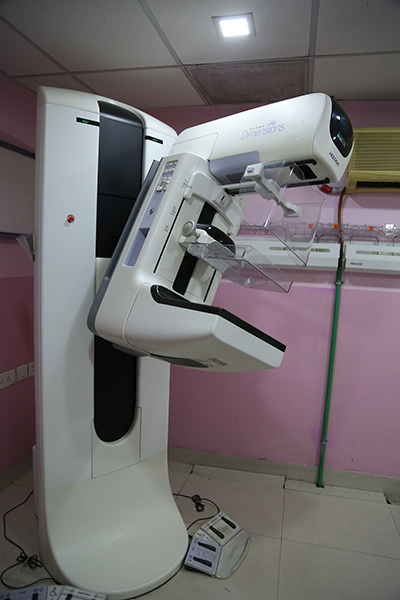 We at RGCI & RC are amongst few institutions in India to have Digital Breast Tomosynthesis with computer aided diagnosis (CAD), which increases the sensitivity of mammography and helps the radiologist in detecting the cancer early. CAD can pinpoint micro-calcifications that may be early cancer and hence increase the chances of survival. Early detection is your best prevention against Breast cancer Treatment. Thousands of women are living with breast cancer and don’t even realize they have it, don’t become a statistic. If you are above 40 years walk in for a mammogram today or schedule an appointment. Mammography is a specific type of imaging that uses a low-dose x-ray system for examination of the breasts. The images of the breasts can be viewed on film at a view box or as soft copy on a digital mammography work station. Most medical experts agree that successful treatment of breast cancer often is linked to early diagnosis. Mammography plays a central part in early detection of breast cancers, because it can show changes in the breast up to two years before a patient or physician can feel them. Current guidelines from the American College of Radiology (ACR) recommend screening mammography every year for women, beginning at age 40. The National Cancer Institute (NCI) adds that women who have had breast cancer and those who are at increased risk due to a genetic history of Breast Cancer Surgery should seek expert medical advice about whether they should begin screening before age 40 and about the frequency of screening.